Last Friday saw the release of our much anticipated 2016 Tipster Betting Awards Report, which included your votes for the Worst Bookmaker… and here are the results! Voted for by both SBC members and you the general public, this award (or should we say wooden spoon!) is designed to highlight those bookmakers falling short of the standards we demand as punters. Whether it is offering poor value odds, shoddy customer service or simply not letting you get your full stakes on – you voted in your droves in what was a very competitive category! 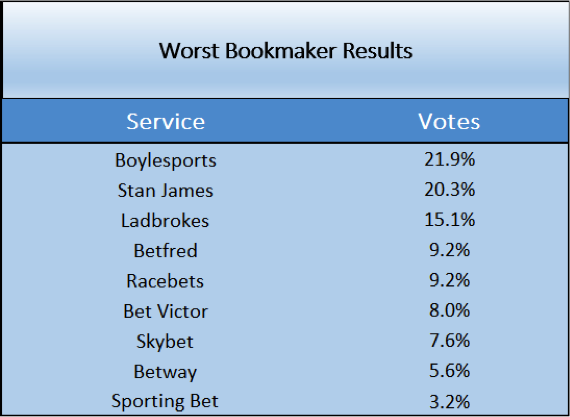 Top of the heap for 2015 as your worst rated bookmaker was none other than Boylesports, who picked up 21.9% of the vote to cement their position as a bookmaker many punters love to hate. They are the recipient of our lovely wooden spoon worst bookmaker award! Not far behind in the rotten bookie stakes was the winner from the last 2 years, Stan James, who notched up 20.3% of the vote to suggest they still have much to do to convince punters to use their services. And finally, the bronze award winner was a relative newcomer to the worst bookmaker stakes –Ladbrokes about whom 15.1% of you ranked as the pits. Considering they didn’t feature even feature in the top 8 worst bookies last year – that is quite a fall from grace. Other contenders worth a mention here include the likes of Betfred, Racebets, Bet Victor &Skybet who all polled a considerable number of votes. As well as helping us have a bit of fun at their expense, there is a serious side to this award – namely to help raise awareness of the bookmakers often not worth bothering with. One of the main reasons these bookmakers are rated so poorly is due to their notoriety as firms that both limit stakes and close accounts for anyone with even a modicum of ability. Should you for example bother opening accounts with Stan James and Boylesports if you expect to win money betting? In my opinion it is often not worth the time, unless you are keen to take advantage of new account opening offers or simply keen to try to win as much as you can, while you can. In terms of our own tipster reviews, we regularly mark tipsters down who quote and settle bets to top prices available with the likes of Stan James and Boylesports. Very often, such prices are a work of fiction as in reality they are not available to all but losing punters. It’s high time the likes of the Racing Post and other media publications considered removing them from any tips or odds comparison tables they produce. It might cause a reduction in advertising revenue but it would be to the benefit of all punters. Alongside your votes on the worst bookmakers, in our 2016 Awards Report, you can also find details on just who was rated the best bookmaker – and those you should consider using for your own betting. Not all of the best bookmakers are household names as some lack the marketing budget or ‘brand awareness’ of the UK high street giants, but often they can make a heck of a difference to your betting bottom-line. Whether this be through offering better value odds or simply standing winning bets or accommodating shrewd punters, it’s well worth utilising their services. 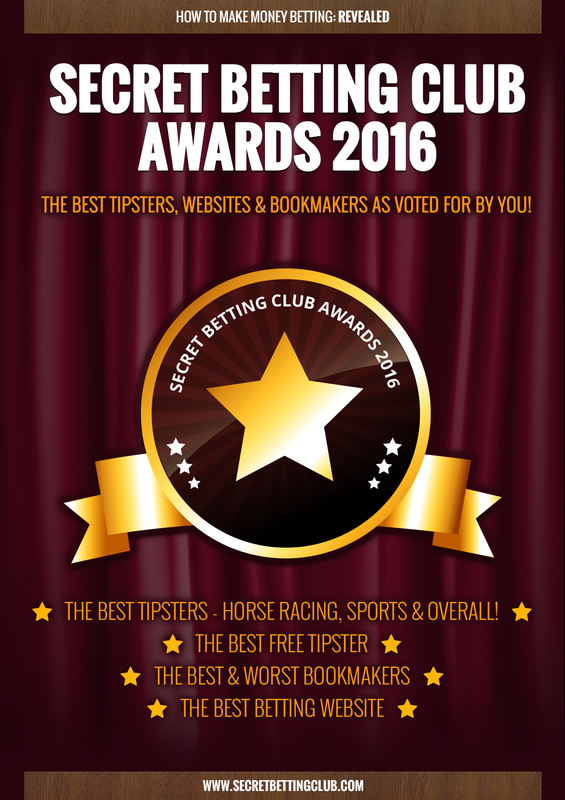 The Best Bookmakers as voted for by both SBC members and the general public. 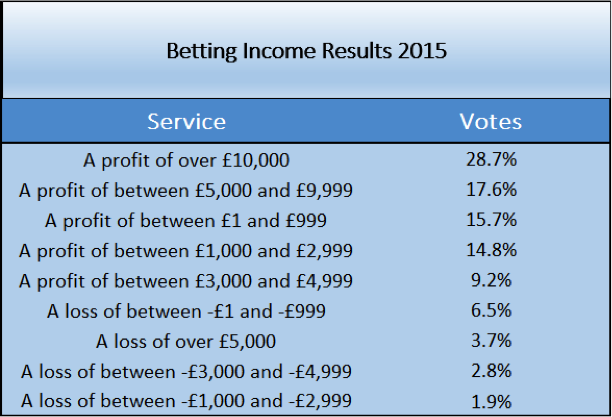 The lowdown on why 85.1% of SBC members made a profit last year from their betting. Why Backing The ‘Wrong’ Winners Can Cost You Big Time! In today’s betting world, there is one principle that you must stick to if you want to maximise your betting profits…and it’s one the majority of punters ignore! I’m talking about punters who follow tipsters (as many very successful punters do) and their reaction when they are sent a hot tip. The immediate reaction from most punters is to get their bet on immediately as they are desperate to be involved. Very often in doing so they grab the best price they can on the tips put forward. We’ve all done it, and most of us continue to do it. But this is exactly why so many gamblers fail to make the level of profit that they really should. So what is this principle that can transform your betting performance overnight? It is the principle of securing value. Securing value really should be the first and last commandment for anyone who bets, because if you are betting value in every single wager you strike, you will make more money. And the greater the level of value you secure in each of your bets, the greater the level of profit you will makE. Take a look at the following tables taken from a very successful horse racing tipster we reviewed in a recent SBC Magazine. It showcases how the odds on the tips they supplied moved after a period of time. Over 90 bets we observed, the average odds for the tips supplied came in at 5.28/1. Yet what we wanted to find out is just what odds would be available after 15 minutes, 60 minutes and at SP. As the first table reveals they shifted down to 4.94/1 after 15 minutes, 4.64/1 after 60 minutes and 4.03 at SP. Now to some of you that might not sound too much, especially the difference between the 5.28/1 and 4.94/1 available after 15 minutes…yet you would be wrong. As the next table reveals, the actually ROI difference is as much as 9.7% within this 15-minute time period. After 60 minutes it becomes 16.5% whilst at SP, you would actually make a loss. The lesson we can learn from this is that if your bets don’t carry as much value as they should do, your ROI figures will shrink and potentially dramatically so. You could ultimately turn a profitable tip into a loss-making one, simply by taking a bad price. And once again we return to that key concept…securing value on your bets! The above is one of the key lessons made clear in one of our latest series of Practical Punter Reports – as penned by semi-pro gamblers making their betting pay. Sticking to these value betting principles is a tough ask sometimes, especially if you miss a winning bet due to the value not being there. For many a gambler, there can be no worse feeling then missing a winning bet…and especially one that had been tipped up to you earlier on. You should have been on…yet you weren’t! Yet if the tip is for 8/1 and only 6/1 is available – the act of taking 6/1 could end up costing you more in the long run. However, as this latest Practical Punter Report outlines, by taking this approach long-term you’ll miss out on backing a lot more losers than winners, and the winners you do back will all be at prices carrying exceptional value. The reward for such discipline is a much higher Return on Investment across your betting portfolio. By simply walking away when the odds aren’t fully in your favour, you’ll be placing fewer bets…but making more money. To make money betting you do have to think differently from the crowd and that is where our Practical Punter Reports can help. Penned by experienced and successful punters, each Practical Punter Report is designed to showcase the reality of just how you can make money from your betting. Whether it’s the tipsters making them money, how to keep bookmaker accounts open and unrestricted for as long as possible, or how to use the betting exchanges to maximise your betting profit, you’ll be receiving expert advice straight from the betting coal face. These are real people making real money from their betting…showing you how they do it! With either Gold or Platinum SBC access, you will have full and immediate access all past and future Practical Punter Reports – including our 2 latest reports released in January.